If there’s one thing Peruvians know how to do, it’s party. With an epic 3000 festivals held every year, the Peruvian calendar is packed with celebrations – an explosion of colourful parades, music, dancing in costume and eating and drinking. 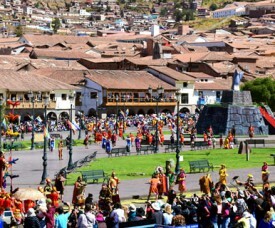 Expect to see anything from locals dressed up as Spanish colonists wearing hideous blue-eyed masks with long hairy beards, to religious icons being paraded through crowded plazas as once were the mummies of Inca rulers. Peru’s biggest festival is Inti Raymi just gone by on June 24, a celebration of the Inca Sun God and winter solstice. But if you’re thinking about studying Spanish in Peru and want to coincide your visit with a festival, there are plenty to experience right throughout the year. Book your Free Online Spanish Class now! Do you want to become Bilingual? Would you like to Improve your Spanish skills quickly? Or do you want to make a quick and fun START with your Spanish? Study Spanish at the time and place that´s most convenient for YOU, at your own pace, with your own private Spanish teacher Online! That is the best and and very affordable way to improve your Spanish skills quickly. What are the benefits of this Learning Online, in a live session with your Spanish teacher? Topics of your personal interest can be included and prepared. Online learning can be more effective educational tool than traditional methods. It may be more comfortable for students to talk with their teachers via technology versus face to face. Did you just finish high school and are you uncertain about what to do next? Do you need a break from studying and want to explore the world? If so, find out why Peru is the Perfect Destination for your Gap Year! Peru is a diverse country with many different climates and environments. Go trekking in the Andean mountains or rafting, or quad riding; go surfing and swimming at the coast, go sandboarding in dessert or go for a ride in a sand buggy and explore Peru’s wildlife in the rainforest. Peru has it all! 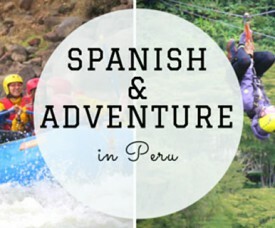 Do you want to improve your Spanish skills in Peru without missing out on the fun and the action? Then our Spanish & Adventure Package is perfect for YOU! 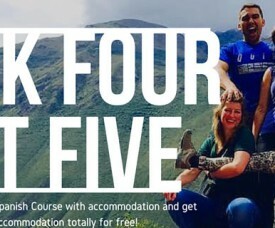 Take a 2, 3 or 4 weeks Spanish course in Peru and pick two of the exciting outdoor activities in the surroundings of Cusco. After this, you continue your travels in Peru or Latin America. Want to add on a tour or trek to Machu Picchu? Book it upon reservering this course and you get a 10% discount. The sames goes for your accommodation in Cusco: book it now and get a 10% discount and live with a local host family or with fellow students in the popular AMAUTA Student Residence in Cusco! Two meals per day included! Price: only USD $ 399!! Are you coming to Cusco to learn Spanish in Peru? Great! We are looking forward to seeing you! If you are now preparing your trip to Peru and you are thinking about whether or not to pack a certain item, here is this very useful list for you: the essential items for the AMAUTA Spanish Student and in Cusco! 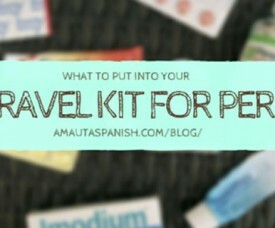 Take a handy Spanish Dictionary with you! In our nowadays digital times, you might not think about it as there are so many apps to quickly translate a missing word…but what if you are without internet in another country? Better to take an analog backup! There are two things to point out concerning your accommodation at the AMAUTA residency or your host family: in any case – please take some towels! You will not need bed sheets or cushions neither at the host family or at the AMAUTA student residence – but towels are not provided!